But the question, really, is will I do better? Or will that perfect photo-op keep receding into tomorrow, next week, next month? So, in the interest of removing obstacles, to blogging and sewing, here is my sweet and lovely, if not particularly well-photographed, Sewaholic Gabriola skirt. So, I like sweet. I do. I’m good with cute, too. But I may have overdone it a bit with this project. This skirt is so sweet it almost makes my teeth hurt. It’s also a bit fancy, to the point where I kinda wonder where I will wear it, as my summer is surprisingly wedding-less thus far. I’ll have to get back to you on that front. I was going to wear it with a lacey Nettie, but that’s been put on hold while I contemplate a) whether I actually can (will) wear anything high-waisted over something tucked in (even a bodysuit) and b) whether I can figure out the stretch-interaction of two layers of body-suit fabric. (Because so far this is eluding me.) 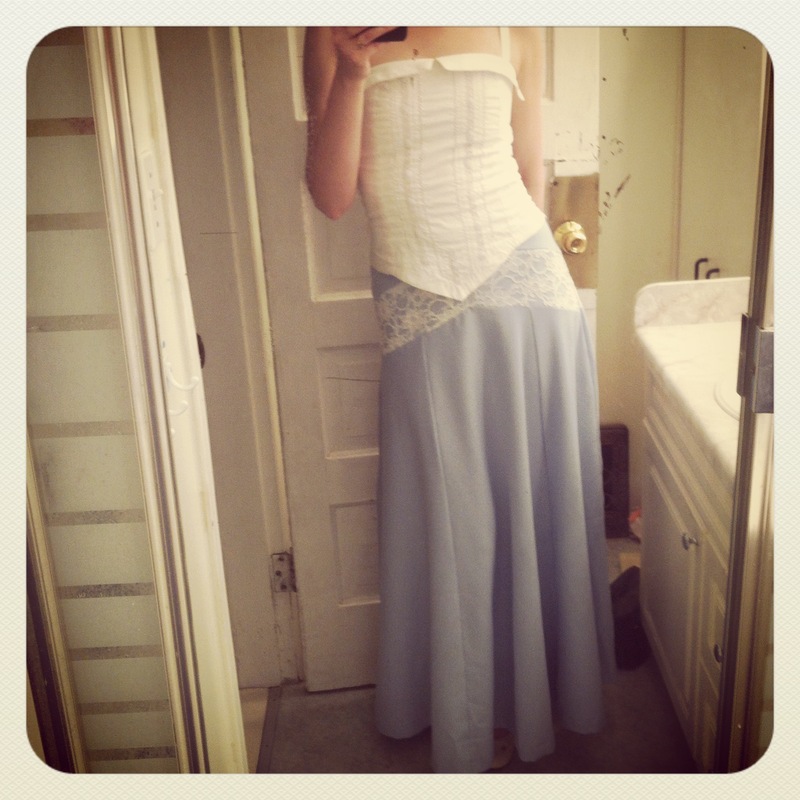 In the meantime, I really like it with my lace-fronted bodice, though, which has largely languished for lack of appropriate bottoms in the two years since I made it. So it’s successful on the front of helping wardrobe orphans. Arguably the scariest part about this project was grading between sizes so that something by Sewaholic would actually fit me. Especially with all those different pieces at the hips. However, it turns out this is really simple, and Caroline even has a post all about it on their Sewalong (which I did not follow in the least, by the way, /sniffle. I’m sure it’s excellent, though.) I needed to go from a size 2 at the hips (rounding up) to a size 6 at the waist (rounding down.) Now if you follow the link, she shows how to grade across both the lace pieces and the upper hip yokes; I did all my grading on the upper hip yoke only, none on the lower lace bits; your mileage may vary. Regardless, it was very simple. I also lengthened the snot out of the pattern—3 cm at the lengthen-shorten here line, and then cutting all the way to the longest size at the bottom. In the end I cut off pretty much all that bottom extra, so I suspect that the 3 cm was more than enough on its own; although, as you can see in the shots with the heels, I could’ve hemmed it longer if I just wanted to wear it with heels. I want to be able to wear it with flats, as experience has shown that heels-only clothing does not get worn around here, so shorter it is. The second-scariest part was matching those lace points at front, back, and sides. Some unpicking was called for, although I allowed myself only one un-pick per point, otherwise madness was a real possibility. As it is, I think the un-picking contributes to a bit of unevenness in the side-seams—probably a wee bit of hand-basting would not have gone awry here. Ah, well. After hand-picking the zipper (see below) I got lazy and did everything else by machine: stitching in the ditch on the waistband, hem by machine. The ditch-stitch actually turned out not too ugly on the inside! OMG! … and of course I forgot to take a photo. 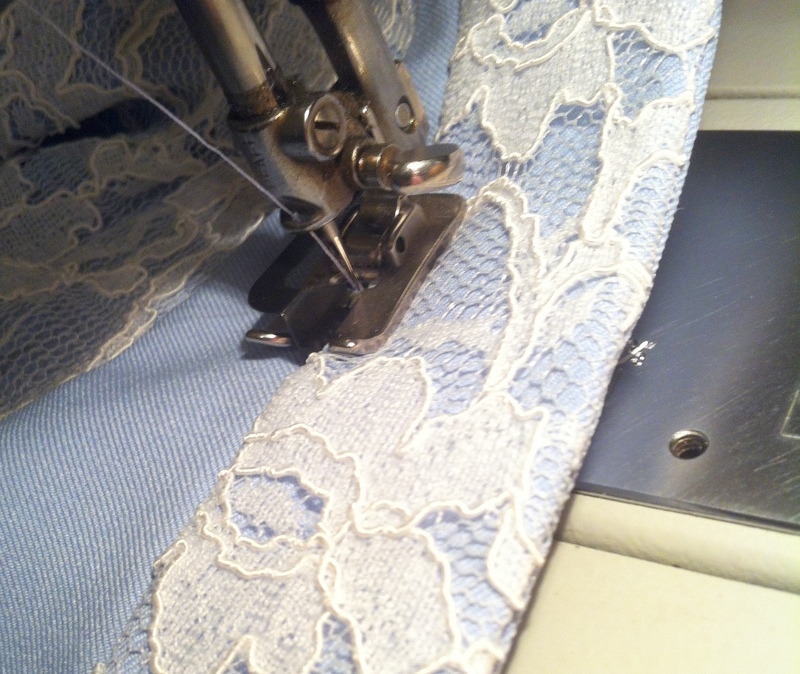 I love the stitch-in-the-ditch attachment for my old Pfaff. It’s not even a whole foot, just a little keel that fits into the regular presser foot, and it is the awesome. 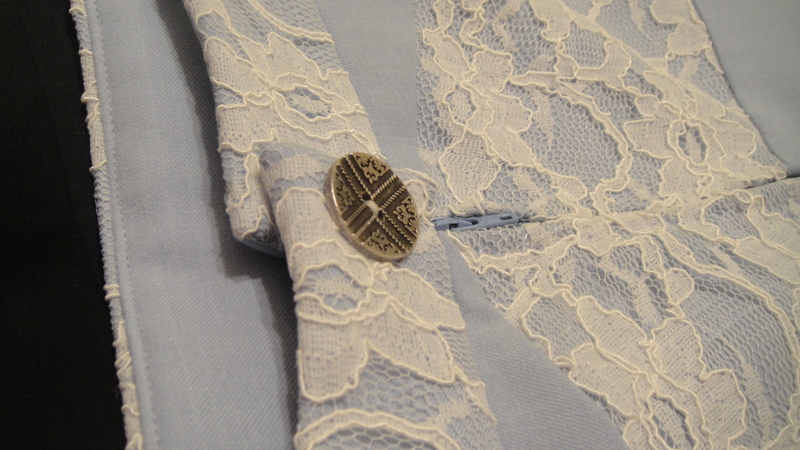 Decorative button, not much overlap on the waistband. I was going to do a functional button. But there wasn’t enough underlap for it to really look good, and also it was going to be tricky to do a nice buttonhole in my bulky waistband. 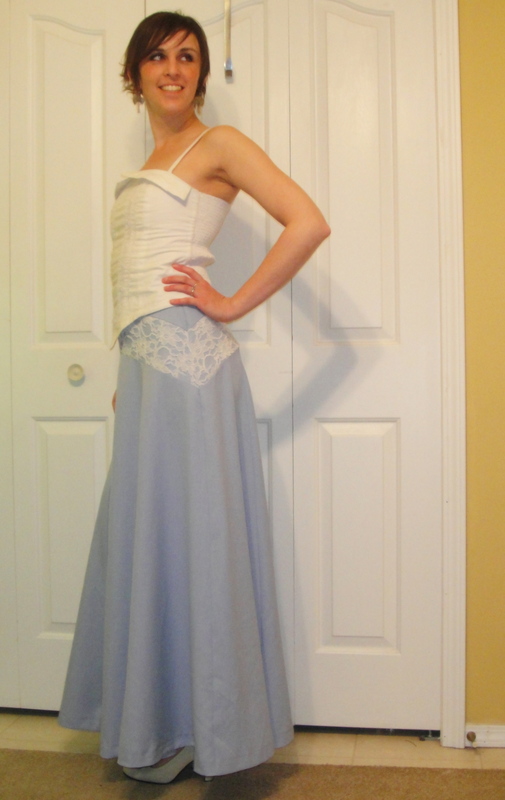 Speaking of which, you can see here the biggest change I did make to the pattern: instead of doing a simple one-piece fold-over waistband, I added a top seam so I could have the lace overlay only on the outside. I thought it would be bulky and scratchy against the skin on the inside. 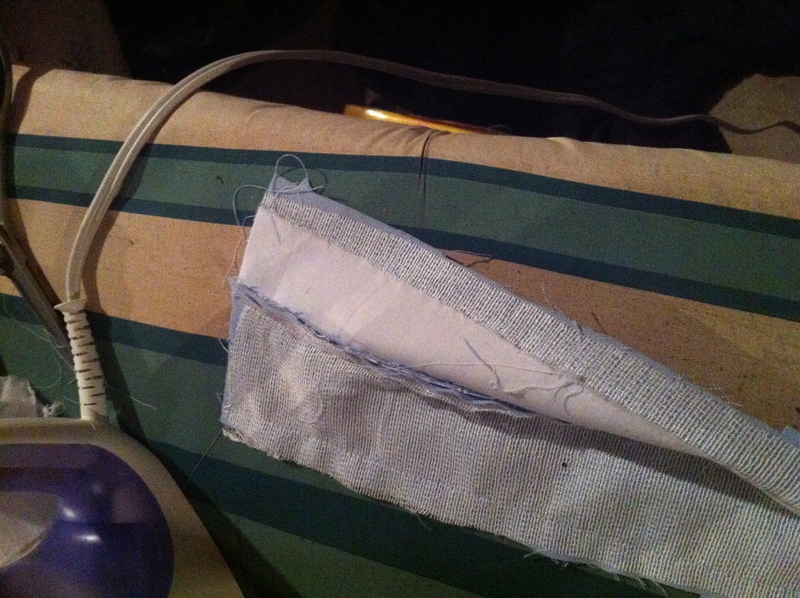 Though the waistband is still kinda bulky with the seam. 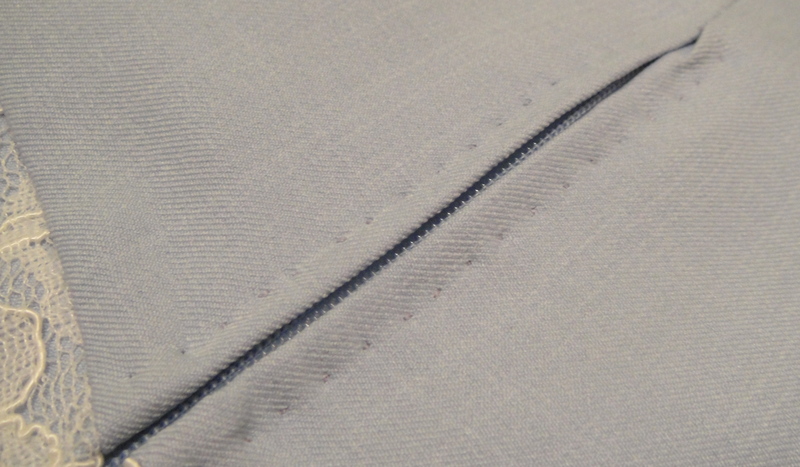 Hand-picked zipper with imperfect fold at the bottom. 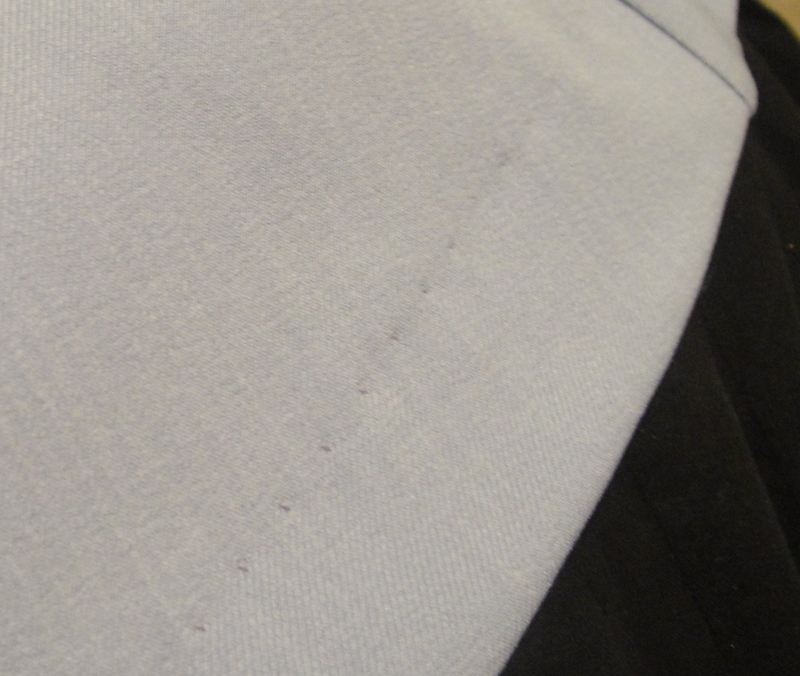 Machine-stitched hem. Boo, couture fail. The zipper exhausted my couture-juice for this project, so I wimped out and did the hem by machine, using blind-hem technique with the same stitch-in-the-ditch foot, but just using the longest zig-zag the Pfaff can handle since it doesn’t have a proper blind-hem stitch and I was too lazy to swap it out with the White, which does but isn’t nearly so much fun to sew with. All in all? 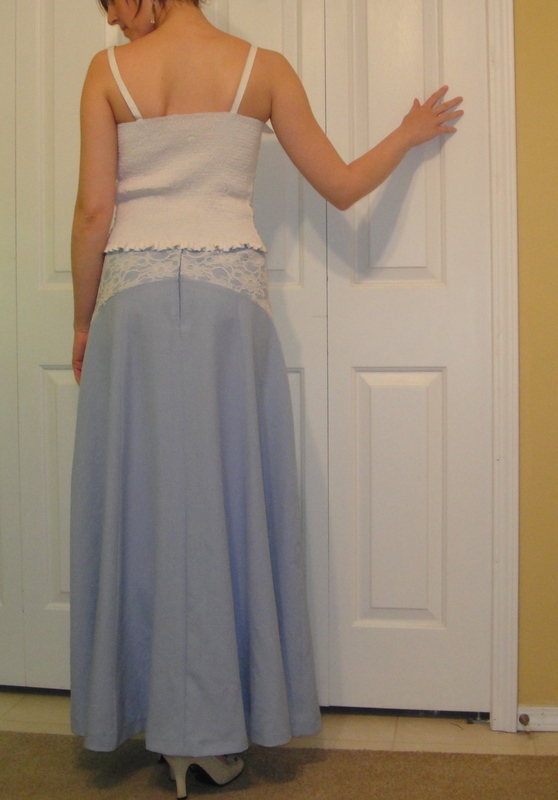 Fit is good (would’ve been better if my waistband were the intended size and not rather elongated); skirt is pretty. Wearability has yet to be determined. Gorgeous skirt! The lace is lovely. Don’t tell me you can’t wear this to get groceries. This lace skirt would look great with my lace Belcarra blouse… I might have to copy cat you. Should be okay a province away? It’s beautiful! Love how it turned out with the lace. It’s lovely!! Lace is a good choice for this skirt!!! Been following it on IG and it’s luscious!! It’s a work of art with that lace. Really pretty and shows off the lines of the Gabriola beautifully. You can tell there’s nice swing and weight with the fabric you’ve chosen as well. I think you look great in it, you can really carry off such a skirt as this. So, so pretty! I sure hope you find a wedding or two to crash, this outfit deserves to be worn! This looks like an outfit I used to wear ALL THE TIME during the week between ren-fairs when was camping on site. Seriously, just add hand made leather shoes (or those cheap chinese shoes, either works), dangling earrings, bangles, and a belt with bells on it and VOILA! Hippy chick for every day use. I love it, beautiful choices. Reminds me of how I used to dress back in my day. Please make sure you wear it now because you can’t get away with the frothy stuff when you’re old! I think this looks really great on you- and it was such a great idea to play with the 2 kinds of fabric in the Gabriola. I have been thinking I’d like to make contrasting colors- maybe a black skirt with a white for the “V”… I keep on trying to envision it! Guess like you I won’t know til I actually make it! I really like the lace insets. I like that the blue colour is soft so it’s not a major contrast. One of my favourites of the Gabriolas I’ve seen. Aww, it looks so good! 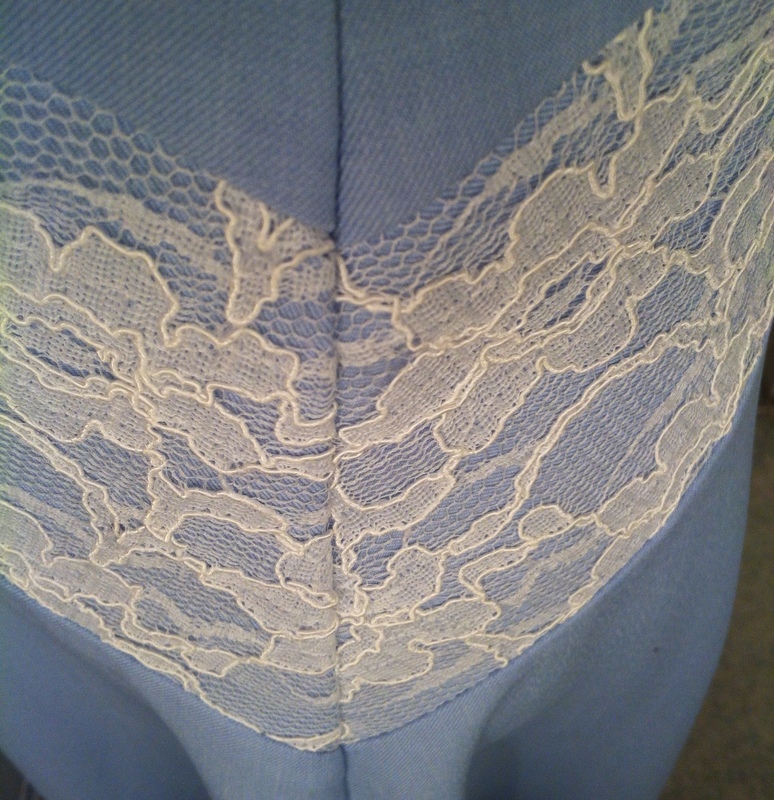 I really love the lace detail, especially on the waistband. Such pretty details! I hope you do find it wearable and wear it a lot. Because wow can you pull off the long skirt! I always feel that they make me look even shorter than I am. 😛 BUT OH do I want a long skirt! I might have to say screw it and make one anyways after seeing this!